First to Buffalo where Don Harry took delivery of his J-844 CC tuba. He used it in the Buffalo Philharmonic later in the week. Mark Jones who subs for Don in Buffalo got one as well. That;s three for Don: J-445, J-744 and now J-844. 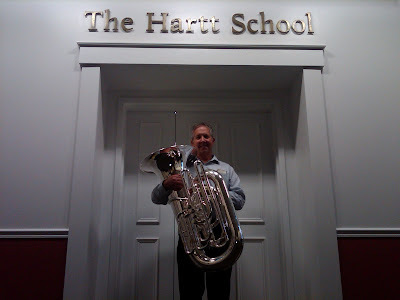 Don took a J-845 that is on it's way to Australia for Ed Diefes, tubist with the Australian Opera and Ballet Orchestra. Ed's tuba made the rounds in Don's studio at Eastman before traveling down under. Then to Hartt School of Music in Connecticut. This is the first time I got to meet Scott Mendoker who in addition to teaching at Hartt, plays in the Philadelphia Brass. Great player and super nice guy. He invited players from the area to come in to try instruments. I got to meet Steve Lamb from the Coast Guard band who has a Nirschl tuba made from the same tooling that now makes the Big Mouth Brass J-845. Pictures in links. Both ordering J-445's and one of Scott's students took delivery of one as well. Then to Mansfield PA where Dr. Nathan Rinnert's studio now has a J-845 and a student has a J-345. A day of golf with my wife at Quail Hollow and finally John DiCesare's studio class at Kent State. John gave all the horns a good workout and sounded marvelous. Watch for his star to rise.